During the war in Vietnam, the US Army Special Forces were headquartered in Nha Trang. During this time, the Special Forces troops had a close liaison with the CIA and the two organizations worked closely on many intelligence and special operations missions. Their most successful covert intelligence unit “Project GAMMA”, had its mission effectively shut down after Gen. Creighton Abrams, the commander of US troops in Vietnam had many in the unit, as well as the 5th Special Forces Group Commander Col. Robert Rheault arrested on August 6, 1969, for the murder of a Vietnamese double agent. Background: Project GAMMA also known as B-57 had been running covert ground intelligence teams into Cambodia since late 1967. They used nearly 500 indigenous assets and operated from nine different sites inside South Vietnam using the cover for civil affairs or psychological operations units. It was the finest combat intelligence producing unit in Vietnam. B-57 or GAMMA produced 65 percent of the usable intelligence on Cambodia and 75 percent of the intelligence on South Vietnam. These figures were supplied by Abrams’ own intelligence chief on his staff. The unit took its orders from the Station Chief of the CIA in Saigon and thru the agency’s satellite office in Nha Trang. Because the members were military, they were nominally under the chain of command of the 5th SFG(A), but Rheault was kept in the dark over much of the unit’s actions as they were on a strict “need to know” basis. Rheault had been in command of 5th Group for only a few weeks when these events took place. One of the reasons for their success, the GAMMA people and the CIA did not include the South Vietnamese into the “need to know.” Their intelligence apparatus was a sieve and had many North Vietnamese agents in place. Because policy makers in Washington had granted Cambodia and Laos “protected status” no US combat troops were allowed there. Only the covert intelligence gathering teams were allowed to operate there. Of course, the North Vietnamese Army used this to their advantage, placing units up to division size right across the border, attacking the south and then waltzing back to untouchable bases in Cambodia to refit, rearm and do it all over again. In early 1969, the CIA and GAMMA were getting concerned. Too many of their teams and agents were disappearing and they were convinced they had a mole in the organization. Then pictures surfaced of one of GAMMA’s assets, Chu Van Thai Khac (AKA Thai Khac Chuyen) speaking to North Vietnamese intelligence officials. The roll of film was taken from an NVA (North Vietnamese) base camp in Cambodia where an SF recon team snuck in stole the documents and film. The handler for Thai Khac Chuyen, a Sergeant Alvin Smith identified him in the photos. Smith was not SF but an MI specialist assigned to the unit. The asset was brought in for interrogation including a polygraph test which was not administered when the asset was recruited for some reason. Execution and Fallout: After ten days of intense “enhanced” interrogation including the use of sodium pentothal, not only did GAMMA learn of the asset compromising the intelligence teams to the NVA but also to the South Vietnamese which made Thai Khac Chuyen in effect a triple agent. GAMMA didn’t take the problem of the intelligence leak to the 5th SFG(A), why would they? They took it the CIA in Saigon and the order came that down thru the Nha Trang office was to “terminate the agent with extreme prejudice” which quickly became the catch-phrase for every spy novel and film for the next generation. The agent was drugged, wrapped in chains, and then taken to deep water out in the South China Sea from Nha Trang harbor. Captain Bob Marasco fired two shots into Chuyen’s head and he and others dumped the body into the sea. The agency came up with the cover story to explain the absence of the asset if questions were asked, he was believed to have disappeared after being sent on a mission behind enemy lines to test his loyalty. Here is where everything fell apart. Smith, Chuyen’s handler, feared for his own safety and retreated to the CIA’s Nha Trang office seeking protection. Word quickly got out and Abrams asked Rheault about the situation on an open and unsecured line. When pushed by Abrams, the Group Commander repeated the cover story. Abrams was never a fan of Airborne troops and especially Special Forces and he quickly had all of the officers and men involved in the situation, including Rheault arrested and placed in Long Binh Jail. All were to be charged with premeditated murder. Gen. Creighton Abrams hated paratroopers and Special Forces especially. He wasn’t alone. The Big Army hated Special Forces, all the attention that the relatively new unit had gotten from National Geographic, Look Magazine and the Barry Sadler craze had rubbed the brass the wrong way. Many senior officers hated that the best and brightest NCOs were choosing on going to the expanding Special Forces units rather than stay and beef up the conventional army. Article 32 Fiasco: Reporters who routinely covered Special Forces found out about the arrests and the story went public in a big way. Most Americans felt that Rheault and the SF soldiers were being made scapegoats in a CIA operation, especially when the defense produced photos taken by the GAMMA Intel team that showed the asset in a meeting with NVA intelligence officers in Cambodia. The public wanted to know why the men were being singled out for killing the enemy, which is what they were supposed to do. Abrams insisted that the Article 32 hearing take place and it did, turning into a circus. The defense hired a civilian attorney, Henry Rothblatt who was well versed in military court martials. He immediately deposed both CIA agents and Abrams himself to testify. The defense also moved for dismissal due to a lack of evidence. There was no body. Abrams tried to have the Navy drag Nha Trang harbor and use divers to find the body. He was taking a beating in the press, he denied the defense the use of any kind of office which further gave credence to his bias. Lack of a body prompted the prosecution to give immunity to one of those charged, Chief Warrant Officer Edward Boyle and was going to use his testimony to push for a murder trial. Boyle refused the offer of immunity and also refused to testify. Meanwhile, another SF recon team inserted in Cambodia and was hounded by NVA troops on insertion, but broke contact and later killed two enemy troops. One was believed to be a senior Chinese intelligence officer. In his possession, he had a case with a list of agents working for the NVA in the South Vietnamese and US military. Listed prominently was the dead “double agent” Chuyen. There was now no doubt that Chuyen was guilty. Both Abrams and the CIA refused to testify, so finally the Secretary of the Army Stanley Resor announced that the charges against Rheault and the others would be dropped. Rheault asked to be re-instated as the Commander of the 5th SFG(A) and it was denied. So, his career over, he promptly filed paperwork for retirement. The others soon left the military as well. Col. Robert Rheault upon returning to the US with his then wife in 1969. Aftermath: Rheault was, prior to this incident, a rising star in the SF community. He was considered a great candidate to make General Officer and his career, on the fast track was ruined. Project GAMMA was shut down in March 1970. 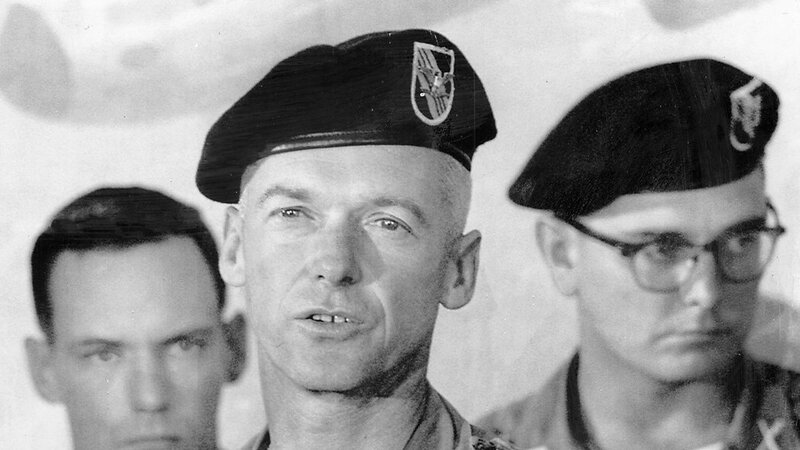 An official Army history of the Green Berets, published after the Vietnam War, does not mention Project GAMMA or Detachment B-57 despite the high level of intelligence garnered. Although the Pentagon has declassified much material about Green Beret cross-border operations inside Laos and Cambodia, nothing on Project Gamma has ever been made available. Rheault never tried to augment himself financially or in any other way over the affair. He did work with veterans of both the Iraq and Afghanistan, assisting veterans in another unpopular war. Lessons Learned: What does the entire affair mean to the SF and Special Operations Forces of today? There still remains within the Big Army some of that petty jealousy and distaste for Special Operations and Special Forces in general. And in the shadowy world in which the SOF operate in today with constant changing of the rules of engagement, troops will always have that question of whether a kill is “a good one.” There was another wrongful prosecution for an SF captain and master sergeant of a “suspected” insurgent in Afghanistan about 10 years ago. Although the charges were later dropped, they never should have been brought in the first place. Allegations are surfacing that certain SOF units from Britain and Australia were operating outside the rules of engagement as well. While the verdict is still out on those, proper caution must always be used in these types of situations. And the chain of command must leave no doubt in the SF operators’ minds on what is or is not allowed in the ROE (rules of engagement). The life of the SOF operators is dangerous enough already, they don’t need anything else adding to it. Including a hostile higher headquarters that doesn’t believe in SOF.